A sushi recipe as simple as they come. Select only the highest quality fresh tuna for this dish; you will be rewarded with thick, velvety sushi rolls that taste exquisite. Slice the tuna into one-inch by two-inch rectangles, about a quarter-inch thick. 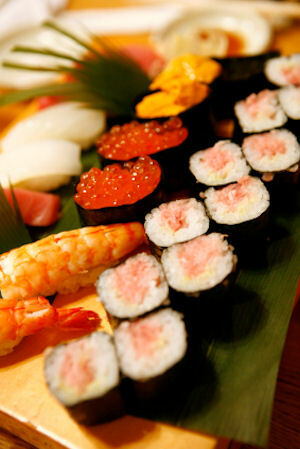 Take a small amount of the sushi rice and cradle it in your right hand at the base of your finger. Using your hands, take the rice and form a rectangular shape to match the tuna slices. Spread ¼ to ½ teaspoon of wasabi paste onto the slice of tuna. Place the rice block on top, and press gently to shape the sushi. Repeat with remaining ingredients to make several sushi pieces. How many calories is in it? I have made and was so good. I love it. Summary: A sushi recipe as simple as they come. Select only the highest quality fresh tuna for this dish; you will be rewarded with thick, velvety sushi rolls that taste exquisite.